Compact powder made with an organic formula. This compact powder feels like natural skin, smooth and silky texture, light doesn't feel heavy on the skin. Powder is also free from parabens. Colour Claire/ light natural, Weight: 7 g.
- Composition: Mica , Talc , Argania Spinosa Shell Powder * , CI 77891 , Magnesium Silicate , Caprylic / Capric Triglyceride , Dicaprylyl Carbonate , CI 77492 , Zinc Stearate, Polyglyceryl -2 Triisostearate , Silica, CI 77491 , Glyceryl caprylate , Dehydroacetic Acid , Perfume, Helianthus Annuus Seed Oil , CI 77499 , Linalool , tocopherol , Limonene , Punica granatum Fruit Extract. - Do not apply a lot of this powder! A small amount is very effective! - For proper application, take a foundation sponge, dampen it slightly and apply a little powder to the sponge. Heat it in the palms of your hands first before applying. You can then apply it on your face from the center to stretch outwards. You will quickly see that an intermediate step in the hands is important, your foundation adheres better and melts faster on your face. 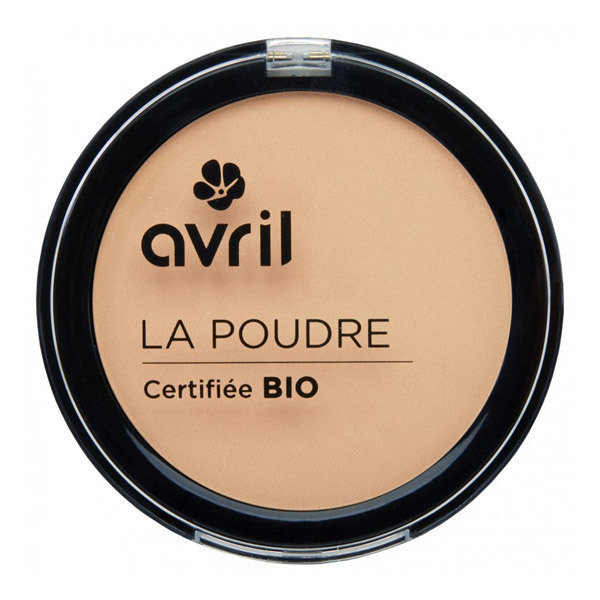 Avril is a new French cosmetics brand that offers a wide range of organic comestics and beauty care products: Makeup, face and body care, shampoos and conditioners and many more products. All Avril formulas are made with high quality ingredients (e.g. nail polish free from paraben, formaldehyde, phthalates, toluene, xylene-free, camphor and also free from rosin), manufactured within Europe and certified organic by Ecocert. As well a taking care of its customers, Avril is also concerned with protecting the environment. Avril, uses less materials for the packaging of their products, by limiting the amount of packaging and promoting large or bulk packages (no blisters, no cartons, bottles 500ml etc.) Avril is able to limit its impact on the environment. Avril cosmetic products are also not tested on animals; Discover this range of natural, environmentally friendly, effective and affordable beauty care products at Greenweez!